Studying stucco decorations of churches provides a valuable insight into the history of Christian communities in the Gulf in the early Islamic period. As one of the most important materials of artistic expression for Christians of this region it helps us to answer many questions about people who lived in what is today Kuwait and other Gulf states. Stucco is easy to produce, cheap and multipurpose material, and widely available ingredients such as lime, gypsum and sand are used for its production. It can be moulded, carved, incised and painted; used in small, portable objects of art and for monumental, architectural decorations. Thanks to these qualities, stucco became extremely popular in the art of the Middle East in Late Antiquity. Beside metalwork and rock reliefs it was certainly one of the most important media of artistic expression in the Sasanian Empire, which stretched in the vast region from Mesopotamia to China in the 3rd-7th centuries AD. Despite its humble composition, stucco was used extensively by the Sasanians not only for simple geometric and floral designs but also in figural representations: images of kings, hunters and animals. Even though the main religion of the Sasanian Empire was Zoroastrianism, its rulers accepted the development of Christian communities in their realm. The existence of Christians is testified for the central part of the Sasanian Empire, which was Mesopotamia, but also for more distant, yet politically and culturally dependent territories, such as the Gulf. Christians of those communities adopted stucco as main decorative material and used it lavishly for adorning their churches. One of the most impressive examples is an almost life-size stucco (possibly of Christ) that was excavated in a church at the site of Koke (Ctesiphon) in what is today Iraq. In the mid-7th century the Sasanian Empire was conquered by the Arabs and its territories were absorbed by the emerging Islamic caliphate. The political change did not have a negative impact on Christians living in this region and—on the contrary—archaeological remains indicate that there was a rapid development of Christian communities in the 7th and 8th centuries in the Gulf. That stucco remained important decorative material for Christians is evident as virtually all church buildings excavated in the region and dated roughly to the early Islamic period were decorated with moulded (fig. 3) and carved (fig. 4) stucco. These include churches on the islands of Failaka (figs. 1-4) and ‘Akkaz (Kuwait), Kharg (Iran), Sir Bani Yas (United Arab Emirates) and the site of Jubail (Saudi Arabia). Moreover, beside few examples of simple bronze crosses, stuccoes are the only objects of art preserved from those sites. The unparalleled popularity of stucco among Christian communities in the region is understandable when looking more closely into the geographic conditions of those communities. Most of them were clustered around remote and—most probably—cenobitic, religious institutions. Although they were in contact with the outside world via ecclesiastical, cultural and trade relationships, they were distant from leading political and artistic centres and relatively isolated. Without easy access to carving stone and possibility of acquiring and transporting large quantities of art objects they relied hugely on the material that they could produce themselves, that is: stucco. Fig. 1: stucco panel from the A1 church at al-Qusur excavated in 1988, now in the Dar al-Athar museum in Kuwait City (a loan of the Kuwait National Museum, no KM 7496). The so-called “almond and diamond” motif is visible in the lower part of the decorative border of the panel (photo. H. David-Cuny, MAFKF 2015). In their artistic production Christians of the Gulf were rooted in the earlier Sasanian tradition. Many motifs known in the pre-Islamic art of the region, such as the so-called “almond and diamond” pattern (fig. 1) and various kinds of floral motifs, were popular also in Christian works of art of the later period. But artists working for monasteries and churches of the region did not limit themselves to simply copying older forms, and created their individual iconographic repertoire. It was characteristic for the absence of figural representations and great interest in repetitive patterns. Decoration of churches included, therefore, geometric and floral motifs such as palmettes, vine scrolls and palm leaves as well as crosses (figs. 1-2) of different shapes. Two main techniques were moulding and carving and sometimes both were employed in one work. 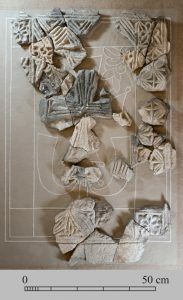 The scale of stucco decorations varied from monumental friezes and panels installed at external and internal walls of church buildings to small, portable plaques with delicate designs. Fig. 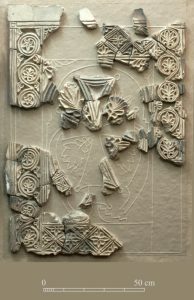 2: stucco panel from the A1 church at al-Qusur excavated in 1989, now in the Kuwait National Museum, no KM 7497 (photo. H. David-Cuny, MAFKF 2015). In almost all cases stuccoes in the Gulf were found in the course of archaeological excavations. With the exception of the church in Jubail in Saudi Arabia they no longer decorate walls of standing buildings. Original decorative programmes of those churches are thus difficult to reconstruct. In some cases, however, assemblages of stucco pieces preserved from one site are large enough to give an idea of how the church building at this site could have been decorated. For example, it can be established whether stuccoes originally covered both internal and external walls of the building, whether door jambs were decorated in any special way and if there is any correlation between a specific part of the building and type of stucco used for its decoration. In particular, it can be determined if the most important part of the church—the sanctuary—was emphasized in the decorative scheme, for example by introducing stuccoes with crosses. 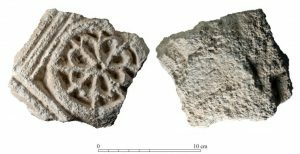 An interesting example of how a stucco decorative programme may be related to the function of a particular church space is known from the large church A1 at al-Qusur on Failaka island. All stucco fragments excavated in this building come from the south aisle and the south chapel only (figs. 1-4). This may be explained by the existence in the southern aisle of a tomb. It is not known who the buried individual is but if he was an important figure for the community than the stucco decoration might have been installed in this part of the building as an expression of veneration or even as a cultic act. Fig. 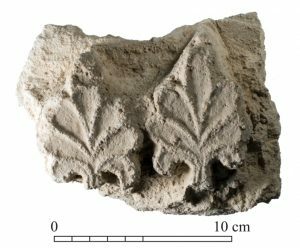 3: fragment of stucco decorated with moulded palmettes, which was excavated in the A1 church at al-Qusur in 2007 (photo. H. David-Cuny, MAFKF 2011). As the main medium of artistic expression for Christians living in the Gulf in the early Islamic period, stucco is of great informative potential. Stucco fragments as well as whole decorative programmes from one site can be compared with those from different sites in the region and beyond. Such a comparison shows whether artistic contacts were established between those sites and if they participated in the circulation of objects and artists. It can also point out which Christian sites were innovative centres of artistic production and which were more peripheral and relied on models and templates created elsewhere. Certain similarities between particular stucco decorations may also indicate a chronological sequence or testify to one work being contemporary with another. 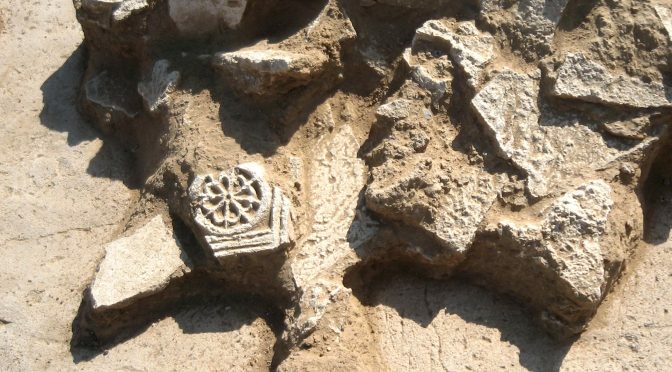 For example, common stylistic features of stucco crosses from churches of Failaka and Kharg suggest that they were produced roughly in the same period. Such conclusions are, in turn, helpful in establishing the relative chronology of stucco production in the region. They also contribute to our understanding of the history of occupation of churches in the Gulf. Fig. 4: fragment of carved stucco representing a rosette (front and back views), excavated in the A1 church at al-Qusur in 2007(photo. H. David-Cuny, MAFKF 2011). Thanks to the development of scientific techniques in archaeology stucco is potentially useful also in establishing the absolute chronology of Christian sites in the region. Until very recently, the only possibility to use radiocarbon dating for determining the age of a stucco fragment was when an organic part, for example a piece of charcoal, had been found in this fragment. Nowadays, it is also possible to radiocarbon date lime-based materials such as mortar, plaster, and stucco. During the process of setting the lime-based material absorbs carbon dioxide from the atmosphere. It can be later isolated in a laboratory and used for 14C dating, similarly as in the conventional radiocarbon dating of organic material. There are, however, many obstacles in using this method and factors influencing negatively the reliability of results. For this reason, so far no successful dating has been achieved for stuccoes and it remains a challenge for the future. In the scarcity of written historical sources for Christianity in the Gulf in the early Islamic era as well as lack of coins, epigraphical evidence and organic material suitable for dating, stucco may be useful source of information for those interested in life of Christian communities in this region. As main decorative material used in the Gulf at that time it helps us to understand what were aesthetic preferences of those people, patterns of artistic exchange they maintained, trade routes they established, and even to reconstruct the chronology of Christian settlement. Baum W., 2003, « The Age of the Arabs: 650-1258 », in Baum W. & Winkler D. W. (eds. ), The Church of the East. A Concise History, London-New York, pp. 93-136. Bonnéric J., 2015, « Christianity in the Arab-Persian Gulf; an Ancient but Still Obscure History », Le carnet de la MAFKF. Recherches archéologiques franco-koweïtiennes de l’île de Faïlaka (Koweït), 23/12/2015 (access: 12/01/2016). [Online] www.mafkf.hypotheses.org/1286. Carter R., 2013, « Christianity in the Gulf after the Coming of Islam: Redating the Churches and Monasteries of Bet Qatraye », in Robin C. & Schiettecatte J. (eds. ), Les préludes de l’islam. Ruptures et continuités des civilisations du Proche-Orient, de l’Afrique orientale, de l’Arabie et de l’Inde à la veille de l’Islam, Paris, p. 311-330. Hauser S., 2007, « Christliche Archäologie im Sassanidenreich: Grundlagen der Interpretation und Bestandaufnahme der Evidenz », in Mustafa A., Tubach J. & Vashalomidze E. (eds. ), Inkulturation des Christentums im Sassanidenreich, Wiesbaden,pp. 42-83. Heinemeier J., Ringbom Å., Lindroos A. & Sveinbjörnsdóttir Á. E., 2010, « Successful AMS 14C dating of non-hydraulic lime mortars from the medieval churches of the Åland islands, Finland », Radiocarbon 51/1, pp. 171-204. Krӧger J., 1978, « Stucco », in Harper P. O. (ed. ), The Royal Hunter: Art of the Sasanian Empire, New York, pp. 101-118. Kröger J., 1982, Sasanidischer Stuckdekor: ein Beitrag zum Reliefdekor aus Stuck in sasanidischer und frühislamischer Zeit nach den Ausgrabungen von 1928/9 und 1931/2 in der sasanidischen Metropole Ktesiphon (Iraq) und unter besonderer Berücksichtigung der Stuckfunde, Mainz am Rhein. Salles J.-F., 2011, « Chronologies du monachisme dans le Golfe Arabo-Persique », in Jullien F. & Pierre J.-M. (eds. ), Monachisme d’Orient: images, échanges, influences. Hommage à Antoine Guillaumont, cinquantenaire de la chaire des “Christianismes orientaux”, Turnhout, pp. 291-312. Salles J.-F. & Callot O., 2013, « Les églises antiques de Koweit et du golfe Persique », in Briquel Chatonnet F. (ed. ), Les églises en monde syriaque, Paris, pp. 237-268. Agnieszka Lic is a doctoral student in Archaeology at the University of Oxford, where she prepares a PhD thesis concerning Christian stucco decorations in Southern Mesopotamia and the Gulf region in the late Sasanian and the early Islamic period. Before her doctoral programme she studied History of Art at the Jagiellonian Univeristy in Kraków, Poland and History of Art and Architecture of the Islamic Middle East at the School of Oriental and African Studies in London. Her research interests are: early Islamic archaeology and art, Christian art and architecture of the pre-Islamic and early Islamic Middle East, Christian-Muslim artistic relationships and architectural decoration in the Gulf. Since 2015 she has been a member and a stucco specialist of the French-Kuwaiti Archaeological Mission in Failaka. An ⲟսtstandіng ѕhare! I have jᥙist forwazrded this onto a coworker who was doing a little homework on this. here on youг internet site. You are most welcome! We are happy if your blog is useful! like you wrote the book in it or ѕomething. A fantastic read. I will certainly bе back. Bonjour. Cet article est très bien documenté. je souhaitais notamment des réponses sur le sujet.